I recently received a request to read a children's book and write a review on it. Most of the time, I am asked to review cookbooks, so this was a very different request! 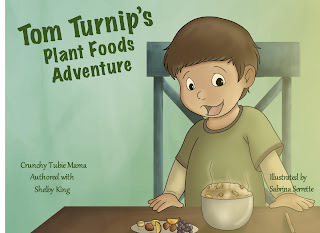 The book I was asked to read and review is called Tom Turnip's Plant Foods Adventure, by Crunchy Tubie Mama (authored with Shelby King). Before reading the book, I decided to watch the introduction video sent to me along with the link to download the book. I am so glad I watched the video first because it gave me an understanding of why the book was written, though I don't think it is essential to watch the video before reading the book. The video is about the author's experience as a mom who gave birth prematurely to a son, who ultimately developed a severe eating disorder called oral aversion because of the medical crises he endured during the first year of his life. After watching the video, I jumped right in to reading the book. Creatively written, the book is about a little boy named Tom Turnip who learns about how "foods that grow from the ground are the very best foods to be found!" Crunchy Tubie Mama is skillful in leading our main character to that conclusion in a way that is engaging and fun. The book also contains several delightful recipes that children can make with their parent(s)--all from whole plant foods! In a word, this book is REFRESHING. It clearly educates children on the importance of eating healthy whole plant foods and without being too complicated, explains what has happened to the world as a result of the negative repercussions of processed foods. EVERY child should be read this book--OVER and OVER. The message is essential!